I never thought I would be writing and sharing about... Bees! But, here I am. I knew about bees' struggle(colony collapse disorder), and also was acutely aware that they are literally vanishing as I would see their little dead bodies so often on the ground. But what can I do? What's the significance of all of this? I went on my search for clues and answers. I read some articles, learned about Bee symbolism and meaning, watched couple of documentaries, researched some bee preservation projects, etc. I've also learned some painful truths like, nearly 1/3 of U.S. honey bee colonies have disappeared because of extensive use of chemicals, artificial fertilizers, etc. ; production of honey on industrial scale made possible by artificially breeding and inseminating the Queen bees; without bees we would not have fruits, coffee, coconuts, almonds, etc. "If the bee disappeared off the surface of the globe, then man would only have FOUR years of life left..." , A. Einstein Wow! I've learned a lot, and yet, I didn't feel complete in my quest, I didn't find peace. I felt there is something else. There is another piece to the puzzle! And then, eureka! 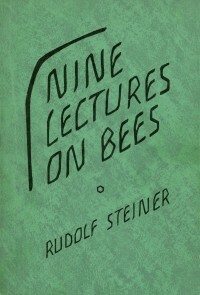 I found this book, "Bees" by Rudolf Steiner . This is one of the most significant writings of the century on deeper truth and wisdom of these incredible Pollinators of Life! So, this is my tribute to these amazing teachers, gracious, humble-bumble BEES that do so much for LIFE on planet Earth! "...in the bee-hive there is a very special and remarkable life. This cannot be fully explained without the faculty of spiritual perception. The life of the hive is extraordinarily wisely organized. 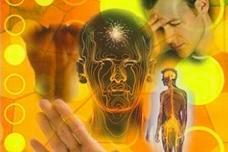 Influences that are coming from the whole surrounding universe work with immense power in the bee-hive. Indeed, one can only arrive at a right understanding of what the life of the bees truly is, when one takes into account that the whole environment of the earth has a very great influence upon the life of the colony. This life within the hive rests upon the fact that the bees , to a much greater extent than the ants and wasps, work so completely together, so arranging their whole activity that everything is in harmony. Life of love connected to the planet Venus. 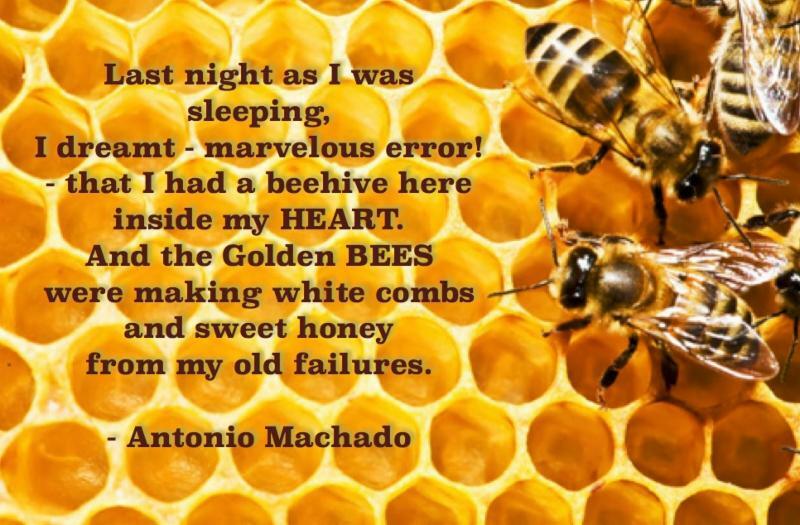 This unconscious wisdom is unfolded by the bees in their external activity. The whole hive is in reality permeated with love. The individual bees renounce love in manifold ways, and thus develop love throughout the whole hive. One only begins to understand the life of the bees when one knows that the bee lives in an atmosphere completely pervaded by love. Hence one must say that the life of the bees must be studied by making use of the soul. The life of this sprouting, budding love is there within the honey too. You can also study what honey does, when you eat it yourself. What does the honey do? When honey is eaten it furthers the right connection in man between the airy and the watery elements. Nothing is better for man than to add the right proportion of honey to his food. In the honey the bee gives back again to man what he needs to further the activity of his soul-forces within his body. Thus when man adds some honey to his food, he wishes so to prepare his soul that it may work rightly within his body — breathe rightly. Bee-keeping is therefore something that greatly helps to advance our civilization, for it makes men strong. BEE Here NOW, and BEE Jolly! Nine of fifteen lectures given by Rudolf Steiner to the workmen at the Goetheanum, Dornach, Switzerland in 1923. They are part of the lecture series entitled, The Functioning of Spirit in Nature and in Man. QUEEN OF THE SUN: What Are the Bees Telling Us? is a profound, alternative look at the global bee crisis from award-winning filmmaker Taggart Siegel .Taking us on a journey through the catastrophic disappearance of bees and the mysterious world of the beehive, this engaging and ultimately uplifting film weaves an unusual and dramatic story of the heartfelt struggles of beekeepers, scientists and philosophers from around the world including Michael Pollan, Gunther Hauk and Vandana Shiva. Together they reveal both the problems and the solutions in renewing a culture in balance with nature. OFFER: with a purchase of one NSA(Network Care) session at a regular price, your second* session is 65%off . We wish you a very Happy Holy-days! Much Love and Endless Joy!